Women leaders are the driving force of innovation and tech in Peel Region & UofT Entrepreneurship. On January 18, 2017, the Globe and Mail published a special article by Jodi Kovitz (CEO ACETech Ontario) titled, “For Canada to succeed on a global stage, we need more women tech leaders.” The article portrays grim numbers of women leaders in tech and innovation as a problem requiring a challenge to readers to mobilize a movement to increase the number of women in tech leadership based on a relatively select sample size of ‘Canada’ and ‘MaRS’. While it is important to look at the top of leadership structures when evaluating inclusion and diversity, it is often equally, if not more important to look at the development cycle of leaders in tech / business to grow awesome leaders into these roles. If one were to investigate the data of how many women start / finish undergraduate degrees in engineering, computer science and perhaps even certain strains of business, and then pair that with how many women have interest in pursuing leadership track careers, I propose one would find similar proportions to match the number of leaders listed in Jodi’s article. From a data perspective, looking at the amount of job transitions most innovators in the tech space face, if 5% of undergraduate classes are women and 3% of the ‘tech industry’ is led by women, that could be a huge success. If you want to #MoveTheDial at the top, you must move the dial throughout the entire cycle of development. UofT Mississauga is in a great position to move the dial in this area as all of the core programs; Management, Communications, Culture, Information and Technology, Mathematics & Computer Science, Masters of Management of Innovation, Masters of Science in Sustainability Management and ICUBE – Entrepreneurship at UofT Mississauga have incredible women leaders, team members and recruiters to help welcome young women into these tech roles and start them on the path to tech leadership. 47% of venture founders who were accepted into the ICE program were women. 72% of the applicants received by ICUBE UTM to work as part of ICUBE’s support team were women interested in being involved in tech. 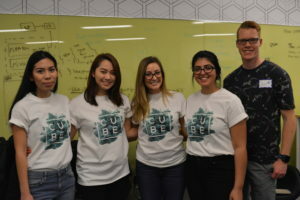 – – 75% of ICUBE UTM’s student support team is young women interested in entrepreneurship. 57% of female students surveyed stated they were interested in starting their own business. 100% of student clubs in Math/ComSci, DEM/CCIT and Business have either a female president of VP. Kinda skinny, glasses, wears a hoodie and tie to investment meetings… however when I think of ‘tech leader’ I see a very different picture. My upline reporting structure, mentors and peer network is stacked with women leaders. Jodi, please consider this a personal invitation to visit the UofT and Peel Region Entrepreneurial Ecosystem and see what’s happening here as you prepare to launch #MoveTheDial. Here is a list of just a few of the awesome leaders (who happen to be women) that are driving innovation in ICUBE UTM’s entrepreneurial ecosystem! Social Media / Special Projects – Kineta WirahardjaIf women leaders in tech is a measurement of future success of a tech industry.Peel Region, UofT Entrepreneurship, and ICUBE UTM is definitely heading in the right direction and paving the way for the rest of Canada.